This recipe is truly a labor of love! It does take time to create but do not let that discourage you from making it. It is well worth it and is a perfect dish to make on a weekend. You can start the cooking process in the morning and have this wonderful dish by dinnertime! A lot of the work for this dish is being performed by the oven and the duck – you just need to lend a helping hand to make it all come together! Rinse duck, remove anything inside it and place breast side down into a baking dish sprayed with non-stick cooking spray. Place garlic, 2 sprigs of sage, rosemary, and thyme into the ducks’ cavity. Lightly season duck with kosher salt and freshly cracked pepper and apple juice. Cover with foil and bake in preheated oven at 275 degrees for 5 hours. While the duck is baking cook butternut squash. Cut butternut squash in half length wise and remove seeds. Place in a pan flesh side down filled with water a 1/4 of the way up the squash and cover with foil. Place in the oven at the same temperature as the duck. Bake for an hour to an hour and a half or until tender. Be careful when removing foil, because hot steam will be released. Remove and let cool. Once cool remove skin and scoop out squash, some may need to be cut into small pieces. After 5 hours have gone by, remove duck and let cool. Remove all meat from entire duck, separating any bones and fat. Place all meat that has been removed form the duck back into the baking dish along with all of the juices from the duck. Add the remaining sprig of sage and place back into oven uncovered for one more hour at 275 degrees. Remove form oven and remove the duck and cut duck into small pieces. Set aside. Reserve duck stock for risotto, which will be about 2 cups. Make sure to remove any sprigs of herbs and garlic that might have fallen into stock. Heat olive oil in large pot over medium high heat. Add cippolini onions and sauté until a light brown. Add sugar and stir until caramelized. Add risotto, stir for about a minute. Then add white wine. Stir until well incorporated. Add duck broth, a cup at a time. 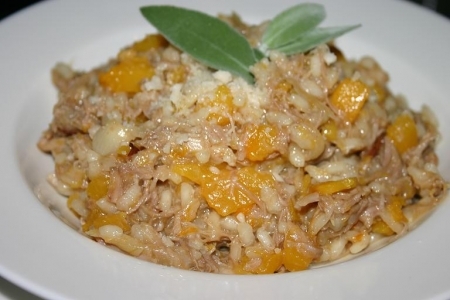 Add butternut squash and shredded duck. Stir. Add remaining duck stock and chicken broth. Stir until evenly combined. Add parmesan cheese and salt. Serve family style or in individual bowls. Garnish with a sprig of sage and parmesan cheese. Try a Le Diablotin Vin de Pays d’OC Grenache (France), Château La Confession Saint-Émillion Grand-Cru Jean-Philippe Janoueix (France), Lo Brujo GarnaCha Calatayud (Spain), Rodney Strong Pinot Noir (California) or Healdsburg Ranches Appellation Series Pinot Noir (Russian River Valley).